Mention the word “coral” to anyone virtually anywhere in the world and they will immediately conjure up a mental image of shallow tropical reefs, bathed in the bright sun and covered with a huge variety of brain, leaf and staghorn corals in lovely gin-clear turquoise water. A beautiful image, to be sure, but few people realize that in reality the majority of corals on Earth actually dwell in cold, deep water far from the sun and hidden from the view of even most divers. Corals live and thrive in ALL the world’s oceans, even in the Arctic and at the Poles, and when viewed collectively their 3-dimensional structure probably represents the largest structural habitat type on our planet. As virtually any diver can tell you, corals are in fact huge colonies of thousands of tiny animals uniting together to form large structures – all coral formations are similar in this regard. The corals found in the tropics contain photosynthetic algae that produces energy from the rays of the sun though the process of photosynthesis. As a result, they are not found in deep or brackish water where sunlight cannot penetrate. The corals found in cold water, however, are not dependant at all on such algae or on photosynthesis, instead feeding on rich nutrients brought to them by currents. Like their tropical cousins, cold-water corals attach themselves to exposed bedrock, steep rocky walls or rock and cobble-covered portions of the sea floor, requiring an absolutely firm base for stability. Once established, multiple colonies of corals can eventually form large coral “gardens”, which act as highly desirable habitat for an incredible array of both fish and invertebrates. 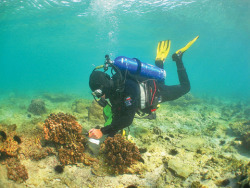 Individual coral colonies and large “gardens” have been found beginning around 80 to 90 FSW as well as some species being documented thousands of feet below the surface. Although these are not true coral reefs like those found in the tropics, they have similar effects in that they form rigid frameworks, alter the bottom topography and form habitats that attract a wide variety of species. British Columbia, Canada, is blessed with several locations at which divers can reach such coral gardens. The primary species found there is Paragorgia pacifica, often commonly referred to as “Pink Candelabrum Gorgonian” or “Kamchatka Coral”. Highly similar to its cousin, Paragorgia arborea, which is found in Atlantic waters, P. pacifica has thick branches and is most commonly found in concave fan-shaped colonies, the shape apparently formed as a result of prevailing currents. Scientists have noted that the typical height of each colony appears to be related to the size of the boulder the colony is attached to – it seems that once a colony exceeds a certain height the strength of the current will cause the boulder to overturn, leaving the coral “face-down” on the bottom. This is a clear indication of the overall strength of the coral structure. The corals have adapted completely to their current-swept, deep-water environment and the available food sources. As filter-feeding animals, in order to capture enough food these corals need a large volume of water to pass through the branches of the colony within a given time. They therefore are only found in areas with persistent and constant current flows. Unlike the hard and stiff colonies of warm-water corals, P. pacifica colonies are slightly pliable to the touch, feeling similar to the hard rubber of the popular ”KONG” dog toys sold in pet stores. This is most likely an evolutionary development based upon eons of adaptation to surviving in strong currents – the basic functions of the coral “skeleton” being to both provide for the efficient ensnaring of food and to withstand the force of the currents. Little data is available on the age and growth rate of P. pacifica, but studies of its Atlantic cousin, P. arborea, indicate that these corals can be well over one hundred years old. Growth rates are difficult to verify, as different locations have conditions that can and will provide localized incentives (or disincentives) for growth.The velocity of currents and the pattern of their movements appear to have a huge impact on both the overall abundance and shape of Gorgonian coral colonies. Most P. pacifica will not only be in a fan shape, they will also be concave in appearance, an adaptation that allows the colony to maximize the amount of water flowing through its branches and, hence, the amount of food particulates collected by the extended polyps. Studies indicate that this concave shape appears more often in larger specimens, indicating that the individual colonies adapted during growth to changing conditions caused by currents. The polyps do not seem to require that the current flow directly into their mouths, but instead can gather nutrients from all sides of the polyp tentacle crown. Additionally, it has been shown that there are higher densities of polyps in the upper, younger, branches of the colonies, indicating that an increased level of food gathering is occurring at the places where the current flow is at its peak. Our team traveled from the Seattle/Portland area to Vancouver Island in British Columbia, Canada, with our stated mission being photographing these deep water corals. With several sites in British Columbia to choose from, we selected the tiny village of Tahsis on Nootka Sound as our base, the waters there being well-known for harboring large numbers of Gorgonian corals as well as being the home of Tahtsa Dive Charters , an efficient and well-trusted operation that has actively supported us in the past. The team consisted of Calvin Tang from Seattle, Washington, Tom Nicodemus of Lakewood, Washington, Matt Spiro from Portland, Oregon, and myself – John Rawlings from Mill Creek, Washington. Each team member was well familiar with the others and we were each extremely excited over this opportunity to photograph animals that few divers have ever seen. We were scheduled to meet up with an old Canadian friend of mine, Vel Wilson, who has made dozens of dives to the thickest part of the coral gardens near Mozino Point, and would guide us to them once we arrived. Calvin and I, using our Closed-Circuit Rebreathers, would concentrate on the deep walls, while Matt and Tom, using standard Open-Circuit scuba equipment, would photograph corals and cloud sponges found above the “recreational limit” at 130 FSW. Briefly, a Closed-Circuit Rebreather is a special type of scuba equipment that enables divers to “re-breathe” the gas that they exhale, rather than simply exhaling it out into the water. The diver can also alter the percentage of Oxygen used in the breathing mix, (Air is 21% Oxygen and 79% Nitrogen), so that during each part of the dive the diver is breathing a “best mix” of gas that will allow for decreased need of decompression – the need to release excess absorbed Nitrogen from body tissues as a diver ascends toward the surface. While “deco time” still remains a fact of life for deep divers, using a Closed-Circuit Rebreather, or “CCR”, allows a diver to stay deeper for a longer period of time without incurring a massive decompression obligation. More and more, this factor is making CCRs the tool of choice for deep water explorers around the world. For this series of dives, Calvin and I had selected a “Trimix” blend to use in our CCRs. Trimix is a mixed breathing gas consisting of a blend of Oxygen, Helium and Nitrogen. The Helium is used to replace part of the Nitrogen that is found in “normal” air, since Nitrogen tends to act as a narcotic under pressure, causing “Nitrogen Narcosis”, a condition in which divers appear to be drugged and lose much of their quick thinking and cognitive abilities. Helium does not have that effect on divers, so introducing Helium into our breathing mix would enable Calvin and I to have clear heads on the deep dives that we were planning. Each member of the team prepared several tanks of gas in advance when preparing for this adventure, and our vehicles were full loaded with both dive gear and scuba equipment – their springs groaning from the weight! To reach Tahsis from the USA is a wonderful adventure in and of itself! The team crossed the border as the sun was just peeking over the horizon, handed over our passports for examination and explained that we were going diving. The thought of scuba diving in the cold waters of British Columbia had obviously never occurred to the Canadian Border Agent, who looked at us as if we were quite insane and asked a few questions about diving to make certain that we were legitimate. It has always amazed me how many people in the Pacific Northwest have little or no idea about the rich and gorgeous world that awaits them beneath the emerald green waters right at their front door! After satisfactorily responding to his question, the agent waved us through and off we sped to the next leg of our journey – the Tsawwassen ferry run from the mainland to Duke Point at Nanaimo on Vancouver Island. This ferry run takes approximately 2 hours and can be a delight for the traveling photographer – a pod of Orcas might swim by, some porpoises might leap and frolic in the wake of the ship, or a Bald Eagle just might seize a salmon in its talons! I always carry my DSLR with at least one telephoto lens whenever I’m on a BC Ferries run because you never know what will swim, leap or fly past! Landing at Nanaimo, our team turned Northward, driving up the center of the island until reaching the town of Campbell River, where we turned West to cross the mountains that form the spine of Vancouver Island. Here, too, a wealth of opportunities exist for photographers as we passed through some of the most beautiful terrain that nature has to offer – mighty whitewater rivers, snow-capped peaks, and stunning forests abound as we wound our way through the hills and mountains, heading toward the coast. Reaching the town of Gold River on the West coast of Vancouver Island, we once again turned North on a partially unpaved logging road and meandered along – twisting and winding with the vagaries of the terrain toward Tahsis – our destination. Seemingly endless forests on either side of the road, along with gorgeous waterfalls and rivers, greeted us at every turn, and the team kept a ready eye out for Black Bears and Roosevelt Elk, two of the large mammal species that dwell here in abundance. About two hours later, we popped out of the trees into a delightful vista of the harbor at Tahsis, where a sign greeted us that said, “Welcome to Tahsis! Population: More or Less!” We had arrived! The next morning the second part of our journey – downward, beneath the waves – would begin. At first a deep rich emerald green, the water surrounding me grows as black as night itself as I drop steadily deeper, the low-visibility thermocline from fresh water rain run-off at the surface blocking the rays of the sun. As we descend we are literally awash in a world of color, bright pink and red strawberry anemones blanketing the bottom contours, interspaced with gorgeous yellow, tan and white sponges of all shapes and sizes and fish of various species dart here and there. Their beauty beckons to my photographer’s soul like a siren’s song, but they are not our quarry today. Looking down the steep wall, I can see the bright yellow Force-Fins of my friend, Vel Wilson, as she is power-kicking her way down the sharp, steep slope. A stiff current is smashing into me from the West and the strobe arms of my camera system act much like a parachute in the wind, forcing me to angle myself into the current or lose all sense of direction. This isn’t easy, and I can hear myself breathing hard into and out of the mouth-piece and loop of my CCR. I’m forced to remind myself to maintain control of my breathing rate. My dive buddy, Calvin Tang, is experiencing similar problems with his camera in the current and the two of us are lagging behind Vel and her dive buddy, Chuck Williams, both of whom are on open-circuit scuba equipment, without cameras, and dropping downward like stones. We can see Vel’s bright yellow fins acting as a beacon in the blackness, though, and soon we find ourselves arriving at the bottom of an absolutely immense wall at approximately 170 feet. Recognizing the bottom contours and realizing that she has over-compensated slightly too much for the current, Vel immediately turns the team East and we allow the current to take us along the base of the gigantic wall, plunging down still another slope. Within seconds we reach 195 feet and an incredible display of bright orange and pink color suddenly bursts into view as the beams of our lights dance across our quarry like light sabers – huge Gorgonian Corals, literally hundreds of them, extend off into the distance. Her job of connecting us with the corals is now done, and Vel waves goodbye as the open-circuit team begins their ascent. Calvin and I are left with only the sound of our breathing and the other team’s lights growing dim above us in the distance. Kicking into the current, we do our best to maintain position as our camera shutters click away, gathering shot after shot of these beautiful and incredible animals that most people don’t even realize exist. The colors are simply astonishing against the inky blackness, and the shapes resemble something from the set of a science-fiction movie. Concave and curving with the current, many of the corals are enshrouded with a lush covering of feeding polyps, gathering rich nutrients from the passing water, while others are completely dormant without a polyp showing. Unlike warm water corals that are dependent on photosynthesis from sunlight, these deep-water Gorgonians set their own schedule for feeding in the utter darkness of their current-swept world and it is perfectly normal to find corals immediately next to each other – some with polyps fully extended, some with no polyps extended, (almost as if they are “asleep”), while still others will have some branches with polyps extended and some branches with none. The difference in appearance is striking and they almost appear to be different species. Temptation getting the better of me, I reach out gingerly and touch one of the dormant branches, thinking that it would be hard like a warm-water coral. To my astonishment, as I’d been told it felt like hard rubber – strong yet incredibly pliable – clearly evolved over the millennia to both survive and thrive within a current-rich environment. Rockfish of various species hover behind the extended coral fans, using them as a shield from the current, while the occasional Lingcod can be seen resting on the bottom behind a coral base. Isolated Longhorn Decorator Crabs, Chorilia longipes, clamber across the branches of some of the coral colonies, and I wonder if that individual colony represents the full extent of that particular crab’s “world”. We see a bright orange and white “orange-peel” nudibranch slithering slowly up the face of one of the smaller coral colonies as it feeds, the color contrast between predator and prey being particularly visually stunning. Reaching the end of our planned bottom time, (even with CCRs there are limits! ), we began our ascent, weaving our way through the individual colonies within this coral “jungle”, still finding ourselves continuously astonished at the size and shape of some of the larger specimens. As we slowly ascend we once again notice that the “carpet” of strawberry anemones has once again appeared, often surrounding the bases of the coral colonies and adding a delightful pink contrast to the almost glowing orange and rust colors of the corals themselves. The size and number of the corals slowly diminishes as we move upward, but their beauty and variety of shapes continues to amaze us. Eventually, we find that we have departed the “coral zone” and have entered depths in which sponges are the predominant large photo subject – Cloud and Chimney sponges being particularly prolific – alongside huge numbers of giant Rock Scallops. In shallow water we find the usual colossal amount of life that is typically found in Nootka Sound, including a vast assemblage of Hooded Nudibranchs in enormous clusters. Having such photo subjects makes our deep stops and decompression time extremely enjoyable, and we ultimately surface with whoops of joy at the sights we have seen during the dive, already thinking about the riches of the dives to come…. While there are several different locations in British Columbia that have access to such corals, our team enjoyed the services and skills of Scott and Jude Schooner of Tahtsa Dive Charters on this trip to photograph the corals of Nootka Sound. As always, everything was handled with the utmost of competency and professionalism. Those desiring to see and photograph these wonderful animals can do no better than by contacting them. This entry was posted in SCUBA Diving, Water and tagged british columbia, canada, cold water, corals, dive gear, diving, nootka sound, photography, scuba diving, tech diving, underwater photography, vancouver island. Bookmark the permalink. Post a comment or leave a trackback: Trackback URL.